Description: A short walk that should never be rushed. Often called the butterfly walk in the summer months for the abundance of life in the area. The view has been described by Alfred Wainwright as “… a moment of magic, a revelation so unexpected that I stood transfixed, unable to believe my eyes.” Ex-Fellwanderer. Notes: This walk includes rough terrain in places and obstacles such as stiles. This walk is not suitable for disabled access. 1) Upon leaving the Craig Manor Hotel turn left, heading in a northeast direction on Lake Road. Follow the road all the way to a slight left turn onto Main Road. After a short distance (approx. 450ft), turn right onto High Street, leading on to the A591. 2) On the main A591 turn right. Opposite Windermere’s railway station, next to the pelican crossing are some prominent railings currently painted green. Behind the railings you will find a large sign that declares Orrest Head with a hand pointing up a private tarmac lane. Follow this lane keeping to the tarmac which runs to Elleray woods through a series of twists and turns. Pass the buildings and bear right, following the rough scarred path climbing through the trees. Once you reach the wall barring the way at the top, turn right, the path is now more level and consolidated. Now turn left through the gateway path, identifiable by the Heywood memorial stones set in the wall either side (see points of interest). Leading up to the viewpoint on Orrest Head. 3) At the view point you can either retrace your steps or, follow an extended route which is suggested by Wainwright. Continuing the route, head in a roughly north direction, over the viewpoint area following the path steeply down through the bracken. Bearing slightly right on the descent to a signpost and stone stile. Here the path splits, cross the stone stile in front of you and descend further. Following the vague pathway as best as you can through the field to a gateway onto the minor road near Causeway Farm. 4) At the road turn left, after 750m bear left at the junction and follow this equally minor lane down to the A592 Troutbeck/Kirstone road. Do not turn onto this busy road but turn sharp left through the ornate iron gateway into parkland. Follow this track heading into the woods, you will now drop down to a little footbridge. In early spring the woods are alive with the pungent but lovely wild garlic. Climb the steps into a narrow lane above the houses. This lane meanders gently, often with private grounds on either side, which you should not go into – there are plenty of warning signs. At the far end of the path it re-joins just at the bottom of the tarmac lane used on the ascent earlier on in the walk. Bear right, returning to Windermere. 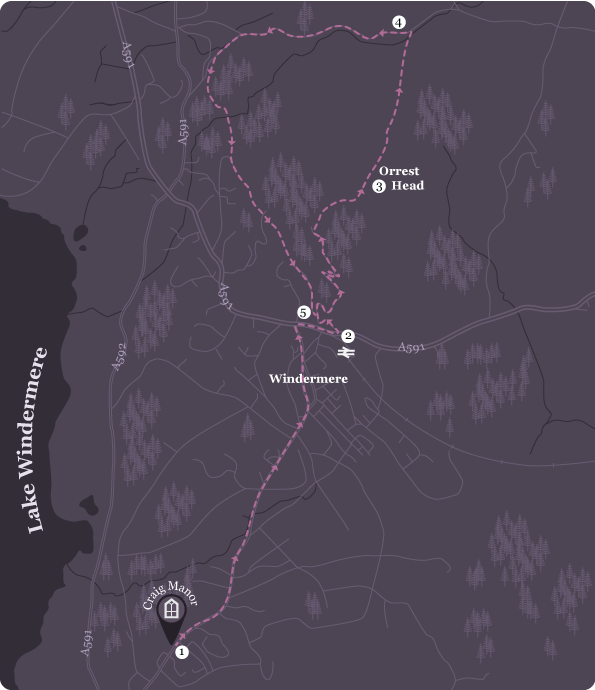 5) You can now either finish the rest of your day enjoying the wonderfully scenic Windermere or return to the Craig Manor Hotel by retracing your steps down lake road. These memorial stones at either side of the kissing gate were placed there in 1902 by the inhabitants of Windermere in remembrance of the wide and beneficent liberality of the late Arthur Henry Heywood. As a mark of gratitude to Arthur Henry Heywood, his widow and daughter dedicated Orrest Head to the use of the public forever. Orrest Head was the first fell Wainwright climbed and is featured in Wainwright’s book ‘The Outlying Fells of Lakeland’, he describes it as “our first ascent in Lakeland, our first sight of mountains in tumultuous array across glittering waters, our awakening to beauty”. On the summit of Orrest Head is the Wainwright Diorama. This slate plaque names the key fells visible from the summit and includes Scafell Pike, the Old Man of Coniston, Great Gable, Fairfield and the Langdale Pikes.